Painting Water colour on Arches Paper on Arches Paper | 9.5" x 15.5"
Painting Watercolor on Handmade Paper | 14" x 8.5"
Painting Acrylic on Handmade Paper | 28" x 20"
I paint anything that stirs up my artistic curiosity. Over the years my fascination has kindled for our rich cultural heritage, apart from other intriguing subjects like nature, cats and the universe. Rabindranath Roy is a science Graduate having completed Bachelors of Science from Calcutta University. However, Roy always had an artist bent of mind since the very early age. 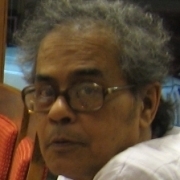 He is trained under the connoisseur of art, Shree Ramananda Bandyopadhyay. He is known to work on multiple subjects like, abstract, floral, figurative, modern art, multi piece, Buddha, religious, equestrian art, wildlife, folk art, still life and heavy texture paintings. His most noteworthy solo shows were held at Academy of Fine Arts, Kolkata in 2011 and 2016.